With looks closely related to those of a traditional lawn mower and a normal string trimmer, walk behind string trimmers stand out as powerful, must-have gardening equipment. Their unique design makes them ideal for traversing rugged terrain that would otherwise prove hostile to an average mower. Likewise, their unforgiving design makes them better at dealing with shrubbery and grass than your average string trimmers. The only challenge at this point is that walk behind string trimmers are gradually flooding the market and, therefore, finding the best one might be a little difficult especially if you’re an inexperienced gardener. But should that always be the case? Stick around to find out more. 9. 946154 Ariens Walk Behind Trimmer 22"
Poulan Pro 961720015 High Wheel Lawn Trimmer Mower, 22"
Dirty Hand Tools 101085 149cc Kohler XT675 Engine, 22"
Wheeled string trimmers come with quite a variety of features. The most basic features to consider include the engine, ruggedness and replacement line availability. Basically, you want to go for a 4-stroke engine, complete with recoil starters. As for ruggedness, you want to go for a 12-inch to 16-inch unit for easy maneuverability. Lastly, as far as replacement string trimmer lines go, you want to go for a trimmer capable of handling heavy-duty lines. Sounds like too much stuff for you to remember? Worry not because in the next part of this review, well talk about the 10 best walk behind string trimmers available. If you’re looking for an easy-to-use walk-behind trimmer that’s capable of handling any challenging job, the Remington 22 might be the best one for you. Its sufficient ground-clearance and rugged wheels make it ideal for taming tough weed growth. On top of that, this machine has received overwhelming attention because of its reliability all thanks to its super-efficient 4 stroke OHV engine. A closer look at its blend of features reveals that it had been made by a manufacturer who is clearly concerned about quality. Its handle is a clear testament to this fact as well – it’s foldable and easy on your hands meaning you can use it for long hours without hand fatigue. On top of that, the fact that this handle is foldable makes this unit easy to transport and store. Another awesome attribute of this machine is that it comes with a large cutting diameter. This is a big plus especially if you’d like to trim hard-to-reach areas. Its 14-inch easy-rolling wheels are a plus for this as well. So, let’s just say that the RM1159 is probably one of the easy-to-use yet aggressive walk behind string trimmers you’ll come across in the market. Of course, we like the fact that it’s easy to change the cutting height. All you need to do is set it low for mowing walls and fences. You can also set it high for plowing through long weeds and grass. Thinking about cutting some grass around obstacles? Worry not because all you have to do is adjust the offset head to tame those nasty weeds. Sounds good? Powerful and reliable engine; makes cutting jobs much easier. Can cut through 2-inch plants. Tends to pull to the left on occasions. Ideal for tough weeds rather than normal weeds. This formidable mower stands out with its medium-powered 163CC engine. Though not best suited for extremely rugged conditions, the machine is just tough enough to tame any unyielding weed that might be troubling you around your house. On top of that, it comes with superb adjustability thanks to a flexible rim height of 1.6 to 3 inches. That means you can use it to maneuver deep through hard-to-reach areas and still count on it to sustain you through tall grass. Well, while this may not be the most perfect string trimmer we’ve ever come across, its 12 inch rear wheels certainly make up for any weaknesses it might have. These provide adequate ground clearance for it making it way easier to trim rocky or bumpy terrains. To top it all up, this machine offers 22 inches worth of cutting width. This is pretty wide and, therefore, a perfect bet for managing above-average jobs. Last but not least, this trimmer is easy to start and operate all thanks to its user-friendly design. Fuel efficient and economical to operate. Superbly easy to replace the trimming line. Slices through average grass and weeds. Generally user-friendly even for newbies. Engine not powerful enough for tough jobs. Cheap plastic carrier plate, brakes if you bump into anything. If you have a string trimmer, you can read our string trimmer harness post. Are you looking for a high performing lawn trimmer mower? Poulan Pro Lawn Trimmer Mower has many features to meet your commercial and domestic trimming needs. Powered by a reliable 190 cc Briggs & Stratton engine, 625 series, the trimmer is strong and able to handle tough jobs. It is black in color with a cutting width of 22 inches. This cutting width is large and able to do large trim jobs very fast. In addition, the trimmer has an adjustable height and it can, therefore, handle different kinds of landscaping challenges. This trimmer uses a 0.155 diameter trimmer line. The rear wheels manage any terrain and are easy to steer with their easy rolling features. This lawn mower cuts heavy and tall bushes seamlessly, managing hilly and rough terrains because of its powerful features including a powerful Briggs & Stratton engine, wide cutting width, easy rolling rear wheels, 12 inches wheels among other features. Operating the trimmer is easy. All you need to do is fuel and oil it and are good to go (just press the starting button ON when starting and OFF when done). In addition, the machine is large enough to be operated conveniently without straining and it has a powerful trimming line as well. As you might be aware, extremely small trimmers tend to be difficult to operate – luckily that’s not the case with the 961720015 walk behind trimmer from Poulan. It is fitted with a Briggs & Stratton powerful engine. The inconspicuous and trendy color black. It is durable and powerful. Its price is a bit on the higher side. Battery powered and therefore cordless, MTC220 BLACK+DECKER Trimmer/Edger and Mower, has been specially designed to handle most of your landscaping work. It is a three in one machine and able to trim, edge and mow. It is specifically designed with three different fittings that are interchangeable depending on the kind of job you want done. Most importantly, interchanging the three tools is super easy. Also, this mower has a foot pedal release for quick insertion and removal of a tool. Another important feature is that the machine has two height adjustment options. It also has a power drive transmission to help in controlling the speed of the trimmer and to prevent the machine from breaking down. The machine has a 12-inch cutting swath. There’s more, it is designed with an AFS auto feed system which ensures that there is automatic and continuous work without bumping. This trimmer is powered by durable rechargeable batteries. The batteries are designed to retain power five times more than other batteries. Other advantages include ergonomic handles, for easy operation. It is a perfect machine if you have a difficult area to trim. The package includes the trimmer machine and two batteries. It is a three tools in one machine, working as a trimmer, edger, and mower. It is small and easy to store. It is powered by rechargeable batteries, it is, therefore, an easy to maintain tool with no requirement of oil or gas. The cutting swath is small, it is, therefore, ideal for light landscaping jobs and not heavy commercial work. Want to know about a lawnmower that can meet your landscaping needs? 25022 Greenworks Corded Lawn Mower is a powerful lawn motor fitted with a 12 Amp motor. In addition, it has a strong 20" cutting deck made of steel. The machine can serve different functions with its 3-in-1 features of mulching, side discharge, and rear bagging. Besides that, the lawn mower operates and runs smoothly in uneven terrains with its specially designed wheels. The rear wheels are wider at 10" while the front wheels are 7". The trimmer has a single lever for adjusting heights, which offer 7 positions of cutting heights from 1 1/2" to 3 3/4". The machine is electrical and corded with plenty of power to manage your landscaping work. Operating this machine is more convenient compared to using a gas-powered or battery-powered machine because there is no using up of time to refill a tank or recharge batteries. Dealing with gas is involving. You have to buy the gas, store it and handling the gas gets the hands dirty. What’s more, the machine is easy to store with its foldable handles. Running the machine is easy. It has a simple push button to start it. Easy storage because of the foldable handles. Durability with a metallic deck. This trimmer is backed by a four-year tools warranty. No stopping because of the need to recharge the battery or refill the tank. It is quieter than a gas-powered trimmer. It has a strong cutting swath. It operates using a cord which has to be managed during trimming. Extension cord is not included. SWFT15022 Southland Outdoor Field Trimmer is the machine to invest in if you are looking for an equipment that will get the job done efficiently. This trimmer deals with any challenging landscaping work including hard to reach spots and overgrown grass. The trimmer is designed with features that make it easy to assemble, easy to operate, and easy to store. First and foremost this gas-powered machine is fitted with a heavy duty powerful 150cc OHV 5.75 ft/lbs of torque engine. Also, the engine uses the recoil fuel delivery system that is easy to start. In addition, the trimmer has a 22" cutting swath with a wide diameter trimmer line head of 0.155". The large trimmer head diameter in addition to the large cutting swath make the machine strong and with a capacity to handle tough jobs. The trimmer is also fitted with an anti-vibration handle that is foldable and comfortable to operate. The machine has a cutting height of 1.4" Another important feature of this equipment is its wheels. The wheels are 12 inches for smooth running on all terrains including steep hills and uneven terrains. Working with this trimmer will see you get less exhausted because of reduced vibration, and accomplishing more work. This equipment is CARB and EPA certified. EPA certified and CARB certified. Easy to start fuel delivery system. Foldable and therefore easy to store. Ideal for both home and commercial landscaping work. Wouldn’t it be great to manage big landscaping jobs easily? The Southland Walk Behind String Trimmer Mower 17 in. 43cc is designed to handle edge trimming, fence, and wall trimming efficiently. The mower has a 10° trimmer head designed for edge trimming and a 20° trimmer head turn around adjustment designed for wall or fence trimming. This string trimmer has a 43cc and boasts of 35% more power than an ordinary 25 cc handheld string trimmer. It has a multi-streaming trimming head that is designed to handle 0.095 in., 0.105 in. and 0.155 in. trimming lines depending on the job at hand. The trimmer has an in-built trimmer string storage for keeping your extra string within reach, in addition to having a length guide for measuring trimmer string to ensure you cut the required 17 inches. The 12" wheels of this equipment are easy to maneuver better than ordinary mowers and able to get into odd places. In addition, the wheels can handle rough terrains. It has an ergonomic loop handle that is easy to control for comfort during operation resulting in less fatigue during work. This machine can be converted into a wheeled edger and wheeled blower. However, it is worth noting that the two are sold separately. A trimmer head that can handle different diameters of trimming lines. In-built storage for trimming linen. Length guide for measuring trimming line. What if you could get a trimmer to meet all your trimming needs? A trimmer able to do more than an ordinary mower can do? Fields Edge M200 String Mower has many features to help you efficiently manage your landscaping work, whether home or commercial work. The trimmer is red and black in color. This machine is gas-powered. It is a strong machine and ideal for heavy commercial duties as well as home landscaping. It is a three- in one machine and it is able to trim, mow and clear brushes easily. This trimmer is powered by a quiet 173 cc engine. The engine is an Ohv construction, air cooled, single cylinder, 4-cycle engine. It is designed to reduce vibration. The wheels are made from Rubber Tire and Nylon Hub. 14-inch High design wheels make the trimmer get to places that mowers cannot. It, therefore, can manage nettles, brushes, weeds and thick grass. The handle being adjustable, you are free to choose the desired cutting height from 0.15 and 3 inches. Operating the machine is easy. It is easy to start the machine, easy to run it and easy to change the trimmer line when it wears out. 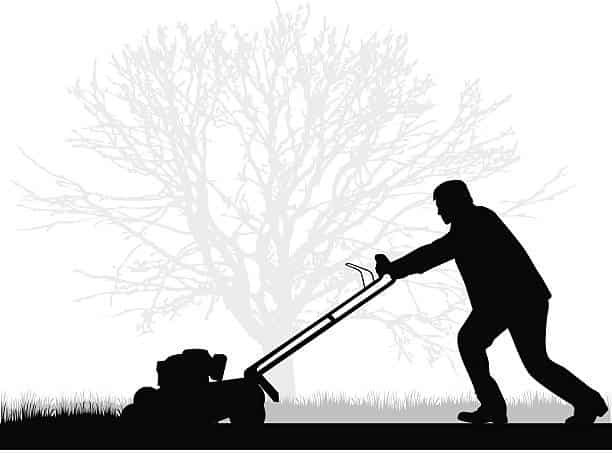 It is easy to switch heads from mowing, trimming and clearing bushes. Storing and transporting this machine is also easy because of a cam lock feature in the handle. 3-in-1 functions of mowing, trimming and clearing bushes. This equipment is very expensive. This machine has international shipping restrictions. Are you looking for an extra-ordinary trimmer? Manufactured in the USA, 946154 Ariens Walk Behind Trimmer is a gas powered trimmer. It has many features, which when combined deliver a powerful trimmer. The machine is a walk behind trimmer and orange in color. The trimmer is fitted with a 149 cc, Kohler Xt650 engine. In addition, the trimmer has steel pivot heads that are reinforced and swivel at 15, they are therefore able to cut accurately and reach hard places including fence lines, borders and under bushes. The trimmer has four adjustment operations and therefore four cutting positions to suit your specific trimming needs and handle different operations. It has a 22-inches cutting diameter, which is large, combined with the tough engine, and it can manage tough grass and weeds. The trimmer has large wheels and strong wheels. The 12 inches wheels easily maneuver tough terrains, thick brushes, and muddy soil. What’s more, the trimmer has a strong and durable deck that is constructed from steel. Operating this trimmer is easy. The engine is a recoil startup model. The trimmer’s ergonomic handle makes operation of the equipment comfortable. The handle is also folded for easy storage and transportation. Replacing the trimmer lines when they run out is also a simple operation. Best of all, this trimmer is approved by CARB. It is fitted with a Kohler engine. Kohler engines are reliable and powerful. This trimmer has a three-year product warranty. This equipment is not eligible for international shipping. 101085 Dirty Hand Tools String Trimmer make lawn care easier with its many features. The trimmer can handle the toughest weed and grass jobs located in difficult places. It is a gas powered trimmer. One feature that gives this trimmer an advantage over others, is that it is fitted with a Kohler engine. The engine is Kohler XT675 149cc with 3600 rpm and approved by EPA/CARB. The engine is easy to start and operate and it is made to last. Besides that, this string trimmer can be adjusted. It has five heights from 1.5 inches to 3.5 inches, It is, therefore, able to reach tough places that a traditional mower is unable to do. Other advantages include the trimmer having a 22-inch cutting swath and large wheels. The 14-inch by 1.75 width wheels run smoothly even on a tough terrain because of their construction which gives the trimmer a perfect center of gravity. The machine has a 4-inch diameter trim ball with dual 4-inch cutting blades which are heat treated. The blades have a width of 0.35" - 1.25" and a thickness of 0.059". Also, the trimmer is designed to resist string pull out making it convenient to operate. Also, the throttle is easy to operate and adjust. The trimmer can handle tough weeds, grasses, and bushes because of the powerful engine, cutting blades and wheels. The adjustable height enables the machine to tackle waist-high grasses and weeds. Unique 4 inch diameter trim ball. Cutting blades that are heat treated. A powerful and durable Kohler engine. Easy to maintain trimmer head. Replacement trimmer line available for purchase. Spare parts available for purchase. String trimmers are not the best for dealing with flat surface grass because they’re rather aggressive and, therefore, difficult to stabilize. But give them an abandoned patch with heavy weed growth and you’ll be surprised at how effective they can be. Most walk behind string trimmers are designed with a rather pointy front and also tend to ride low. This is particularly useful especially if you want to trim grass from under an old vehicle that may be abandoned in your compound. So, in a nutshell, this tool tends to deliver great power in small packages. String trimmers are designed to cut down wayward weeds in some sort of orderly fashion and this gives you a chance to be on the lookout for natural hazards. This is unlike ordinary lawnmowers which are designed to cut through the lowest ends of weeds – something that makes them (the mowers) susceptible to damage in case of collision with debris. To buy the best wheeled string trimmer, there are a few factors you need to ponder upon. First off, remember that compromising on your budget and going for the cheapest string trimmer available may not always be the best thing to do. Sometimes, it’s a good idea to invest in a well-made unit even if it costs a few more bucks as this can help you avoid a lot of frustrations in the form of future repairs and replacements. So, to help you determine the wheeled trimmer that best serves your needs, here are some factors to consider. Think about the acreage you intend to trim and the sort of terrain you have to deal with. Based on this, you can easily decide whether to settle for a heavy-duty model or a light-duty one. Light-duty models tend to be cheap but can only handle occasional weed growth in tiny yards. Heavy-duty models, on the other hand, tend to be best suited for arduous jobs and can even be stretched to serve commercial roles. If you have issues with space, then it’s in your best interest to go for a unit that comes with a fold-down handle. This unique design would make such a unit easy to tuck away in the garage even if that means putting it under other stuff. Ultimately, your comfort matters a lot when it comes to trimming hedges and yards. So, go for a unit that has a well-designed handlebar. Ideally, the handlebar should be angled in such a manner that it reduces the strain of pushing and pulling the trimmer all day long. Most importantly, make sure your preferred trimmer has sturdy vibration dampening features. Taking all those factors into account, our best pick is Remington Walk-Behind String Trimmer 22-Inch. We like the fact that it is sturdy and hardy. Its engine is also quite powerful and that means it can handle any above-average job with no major qualms. Most importantly, we like the fact that it has super-large, easy-to-roll wheels which make it the ultimate king of rough terrain. So, it’s two thumbs up for this string trimmer from us! Always wear goggles with side protection. These can help protect your eyes from any run-off debris. Because walk behind trimmers are designed for heavy jobs, always wear gloves when operating them. With the risk of garbage and pebbles being thrown at you imminent, it’s best to wear heavy jeans pants when operating your machine. Last but not least, never use your trimmer while wearing sandals or flip flops due to the risk of debris and other toxic plants that might harm you. 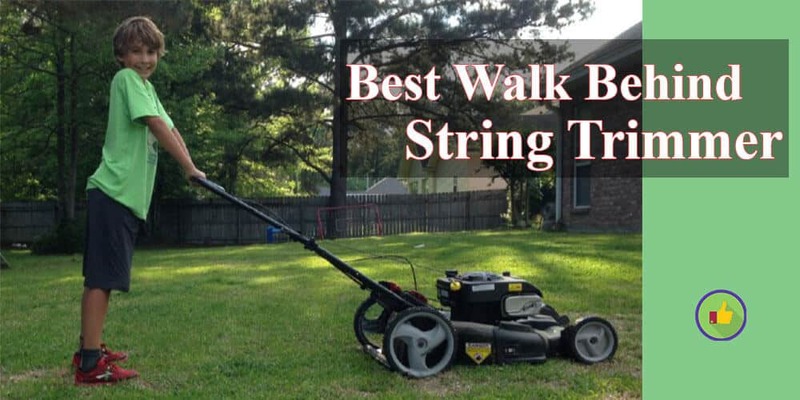 The best walk behind string trimmer isn’t necessarily the cheapest or most hyped of all. As we have seen in this in-depth review, your demands should always be the factors determining the kind of product you settle for. While at it, please don’t compromise, it’s better to spend a few dollars more and end up with a strong and stable machine than skimp on quality and end up with a terrible weed whacker.